The sequel to the highly popular Champions of Norrath is finally here and for those of you who are less informed on the Champions series and what the original was about, here is a little peak at the game. Champions of Norrath was a third person action adventure RPG that consisted of tons of dungeons. The game also included online capabilities, but to be quite honest the game really never took off on the online realm. With that being said this was a very deep and complex Action RPG that was not only a lot of fun but a great gaming experience. Now does Return to Arms carry that same sort of quality with it or is this a forgettable sequel? 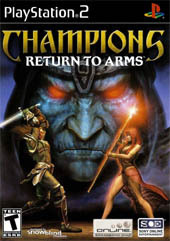 In the beginning, Return to Arms starts similarly Champions of Norrath, with you creating your character. But this time around, the developers have added two more races to the bunch, which include the Vah Shir Berserker and the Iskar Shaman. These two new characters are a welcome addition, but don't offer up much difference in terms of gameplay mechanics between them and the returning characters. I would have loved to have seen more of them added, but then again there is always room for improvement. So moving from the characters into the game story, I must say that I did expect more from Return to Arms than they offered in this game. Similar to the first game, you really never grab a hold of what is going on in the game, nor do you ever really care. Never once does the game really try to get you interested, it's a very linear type storyline that never once in the game gained any steam. So now we see that the storyline is pretty disappointing, does the gameplay make up for those faults? Well this year's game, to be honest, isn't a whole lot different from the last edition. When I say that I am not being all negative because that's not necessarily a bad thing. It's just right when you start the game you feel like you are literally starting where the game left off last time. There have been some gameplay tweaks and improvements but nothing that makes this game all that much different (playing wise) then the previous. 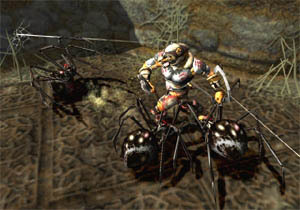 You will spend most of your time from dungeon to dungeon taking on swarms of monsters, and then moving on to the next dungeon. The combat system is still as addictive as last time and works excellently, with plenty of variety and an easy to pick up system. But by far for those of you who remember Champions of Norrath's online components will be happy to know that this is where most of the major improvements in the game have taken place. No longer will you have the silent lobbies that you could never find a game in. No longer will you wait around for fifteen minutes to find a game and then later on just getting booted off from it. Now SOE has showed us that they are still great at online play and implemented some very intriguing online play. Just the look of the online realm is so much more improved then last years game. Online the game really plays well, it's not anything revolutionary but I found it to be quite entertaining. In terms of the single player, Return to Arms doesn't really offer anything new or exciting from last year's game. But in terms of the online component, SOE and Snowblind Studios really stepped it up and provided us with a great online play that will most likely attract many action RPG fans. When we look back at Champions of Norrath, we see a game that closely resembled Baldur's Gate: Dark Alliance, and with that being said it contained an overview third person view that really looked quite good. This time around does Return to Arms improves upon the previous games graphics? The common trend with Return to Arms (except for the online play) is a lack of change in the game. The graphics also fall into this category as this game almost looks identical to Champions of Norrath. The visuals of Return to Arms really make the game feel more like an expansion pack then a new game, because they just look so similar. Of course this isn't necessarily a bad thing as I found the first game to look quite good; all of the character models seem well detailed and nicely designed. The environments look identical to the last game in terms of quality which is quite unfortunate. Overall it's not that the visuals of Return to Arms are bad, but instead they just aren't an improvement over last year's game. I guess all that could be said from this point is that the game leaves plenty of room for improvement for a third installment. In conclusion, Champions: Return to Arms, even with its flaws, is still a very well made third person action RPG. For those of you fans of the original wishing for better online support should definitely check out Return to Arms, because I think it just may have what you are looking for. And for those of you who missed out on the original, you should go give this game a try - it's got quite a bit to offer.